SCAM / FRAUD ALERT! College Street News, Bloor News, Danforth Magazine, Queen Street News, Paul Murton = Con Artist, Hustler, Deceptive Practices. Please be careful with Paul Murton (http://www.paulmurton.ca). DO NOT GIVE HIM A CREDIT CARD OR BANKING INFORMATION. He will RUIN YOU!!!! BEWARE!!!! Paul Murton preys on vulnerable shop owners by swindling them for artificial ads in newspapers he does not distribute. He dates older women and gay men in the hopes of ripping them off. He runs a variety of scam operations and aligns himself with other scam-artists and fraudsters. He does not use his own name. 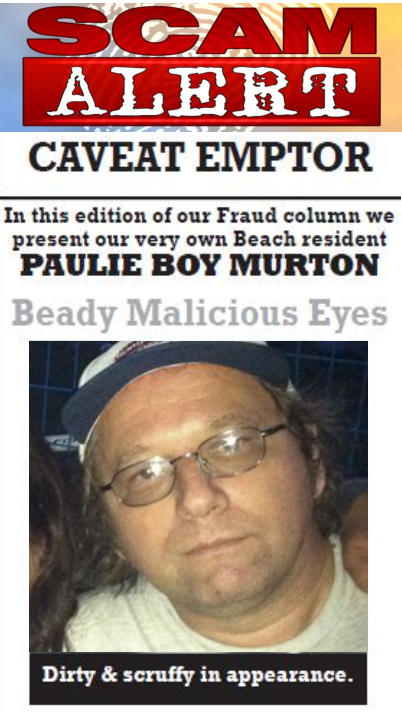 He steals the identities of Gary 17 and Leroy St. Germaine but he is Paul Murton and intimidates defenceless immigrants with shops as well as conniving them into thinking their ads are being distributed to local residents. Paul Murton is living off welfare while pretending to assume a different identity. He is a major hypocrite and swindler that is cheating everyone out, lying to medical doctors and the government about his health. I read his rebuttal about Leroy St. Germaine and I really believe it is false. There are many legitimate professionals assisting Your Ward News to collect content. The divergence of the people collaborating with Leroy is quite vast and many are in licensed professions, giving of their time. I first met Paul through this circle and though Leroy’s newspaper is half farce and half angry about the gravy train in Toronto, Paul is a major snake that has nothing to show. What is interesting, of late, is the photos on his website with Mary Margaret McMahon, who LeRoy wrote negatively about for a long time. Mary Margaret is very unpopular in her ward and yet, that eponymous fake Paul Murton is now taking photos with the woman. It is very hypocritical and unethical. I have interacted with Paul Murton and watched him play people on all ends to meet his objectives. I believe he is under the influence of drugs and so I feel sorry for him. But he is not to be trusted and given he is on a benefit he doesn’t need to be preying on anyone, definitely NOT vulnerable people!! !